Were you at the St. Patrick’s Day Parade this past weekend? And did you see these incredible banners there – it’s a DIY mini-billboard. Thanks to Darren for his work on the bike trailer and the materials he donated. Thank you to Louise at Toronto Cow Save and Mary at Vegan Army/Gopala / RVCC for providing the photos. Thank you to Rob at Panographics for the design work. 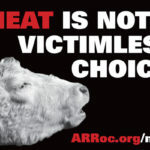 Banners bought with donations to ARRoc, thank you. And thanks to Tom and Darren for riding them around! This is our friend Freddie, one of the lucky few to have been rescued, among hundreds of millions who were not. Photo by Mary B. 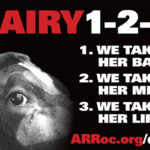 The cow in our Dairy 1-2-3 banner is a breed used for dairy. 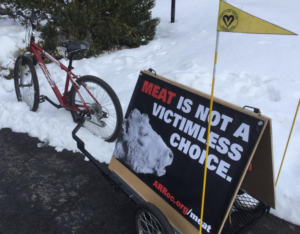 This photo was taken February 13, 2018 just outside Regency Meatpackers by Louise J of Toronto Cow Save; used with permission.